El plan de estudios reemplaza al anterior plan de estudios del año 2001. Este plan de estudios empezó a regir en el ciclo 2015-1. Su implementación ha sido progresiva y es el plan vigente en la Facultad de Derecho. 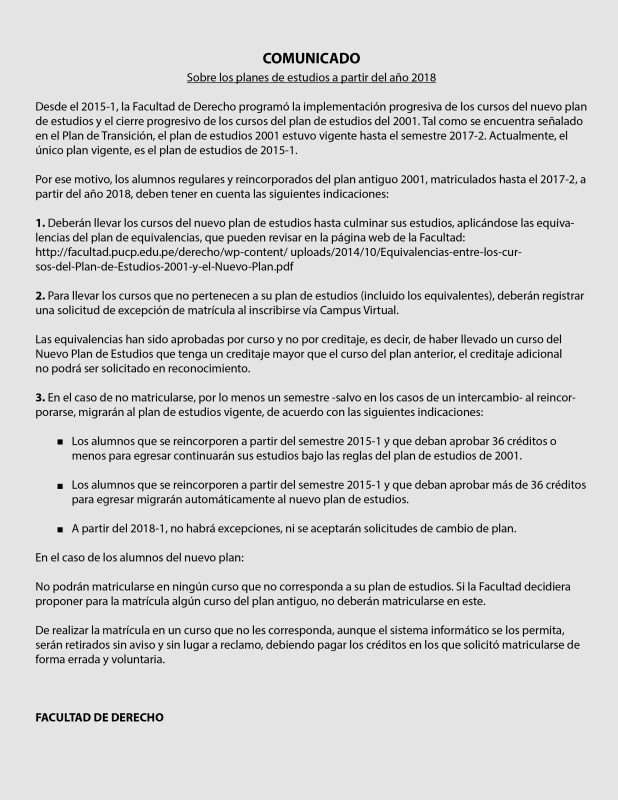 El plan de estudios de 2001 estuvo vigente hasta el ciclo 2017-2, inclusive, por lo que durante seis semestres (2015-1 a 2017-2) coexistieron dos planes de estudios en la Facultad de Derecho. 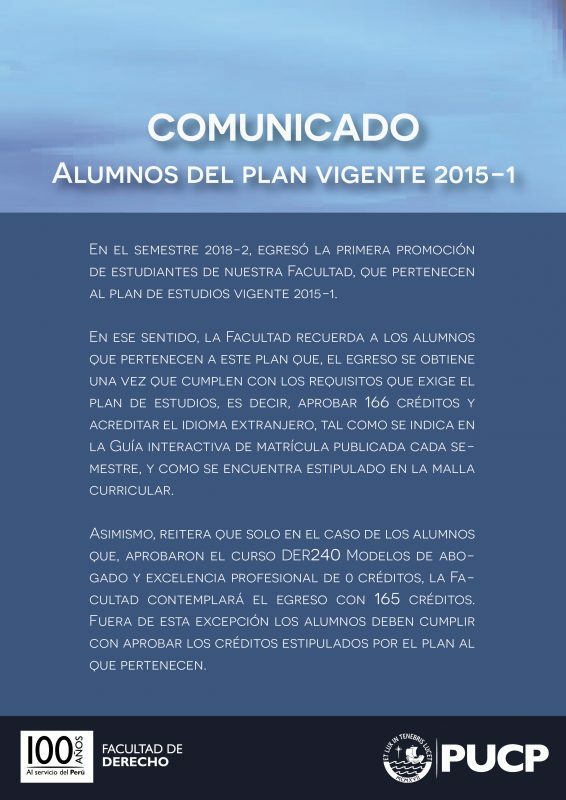 Los cursos prerrequisitos de ingreso a la Facultad de Derecho en el plan de estudios 2015. Para ello se prevén pautas generales que responden a la necesidad de alcanzar los objetivos del plan de estudios vigente. Las situaciones particulares no previstas en el plan de equivalencia se resolverán de acuerdo a los objetivos del plan de estudios 2015 y el respeto de los derechos adquiridos por el alumno. The new curriculum replaces the previous 2001 curriculum. This new curriculum takes effect in the 2015-1 cycle. Its implementation will be progressive and will culminate in the 2018-2 cycle. The 2001 curriculum is valid up to and including the 2017-1 cycle, so for five semesters (2015-1 to 2017-1) two curriculums will coexist at the Law School. The course prerequisites for admission to the Law School per the new curriculum. To this end, general guidelines are foreseen which will respond to the needs of achieving the objectives of the new curriculum. The particular situations not covered by the equivalence plan will be resolved according to the objectives of the new curriculum while respecting the rights acquired by the student. A New Plan of Studies, a new way of learning Law. Our responsibility and compromise with the highest standards of education inspire us to permanently reflect on the way of teaching, learning and applying law. The emergence of new social, cultural, environmental and economical problems forces us to implement new legal approaches to a changing reality. The inclusion of Peru to the international legal system in areas such as Human Rights, free-trade agreements and international investments, implies an updated educational program that includes the latest innovations in legal education worldwide. This new reality determined the implementation of a new plan of studies which stands out for its interdisciplinary nature.